Friday is probably the most popular day of the week, but Tuesday always makes me smile. Tuesday the Pug that is. 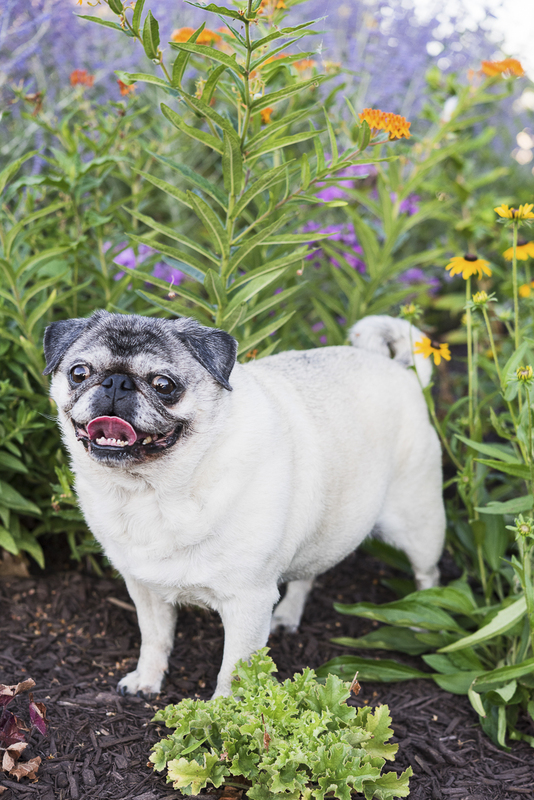 I had been following Tuesday the Pug on Instagram for a while before I realized that she lived near me. I called my sister, Alice G Patterson, and told her all about Tuesday and her momager, Kristen. One day Alice recognized Tuesday and Kristen at the park and introduced herself. 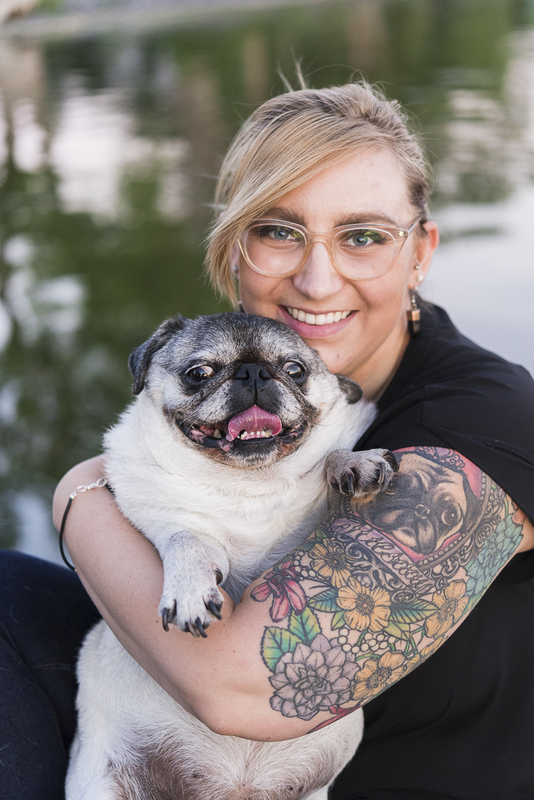 After a few years of mutual admiration, Kristen won a bid on a photo session with Alice through Buffalo Pug & Small Breed Rescue. If you don’t already love Tuesday, you’re about to! Tuesday’s sidekick, Louie, joined in for a few photos before Alice, Kristen, and Tuesday headed to Tuesday’s favorite park. From Kristen: “When I rescued Tuesday I was a college student, and I was struggling to fit in with my peers. I have always been older than my years and the thought of hitting up bars, drinking to oblivion, and dancing the night away had zero appeal to me. Often I was left feeling very isolated and lonely after my classes ended for the day. I had no intention of getting a dog while I was in college, and hindsight, it was probably the worst time to get one. But fate doesn’t play by the rules. I remember I was home for the weekend, as I was most weekends, and was browsing craigslist for something to do. 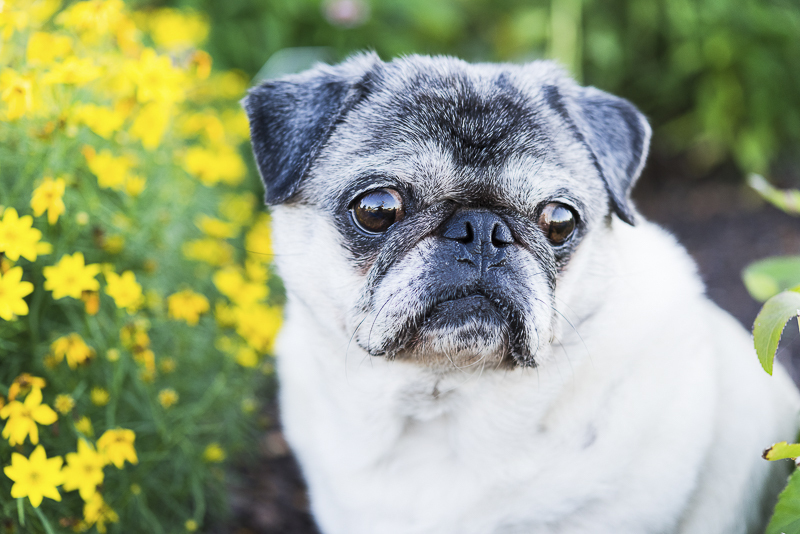 I stumbled upon a post from a family that was trying to find a forever home for their daughter’s pug. There wasn’t a photo attached to the listing, just a plea for help. I can’t pinpoint anything specific about the post; I just knew that this was meant for me. So I reached out to this elderly couple to inquire about Tuesday, or Peanut Butter as she was known then. After a few short emails back and forth we agreed to meet. 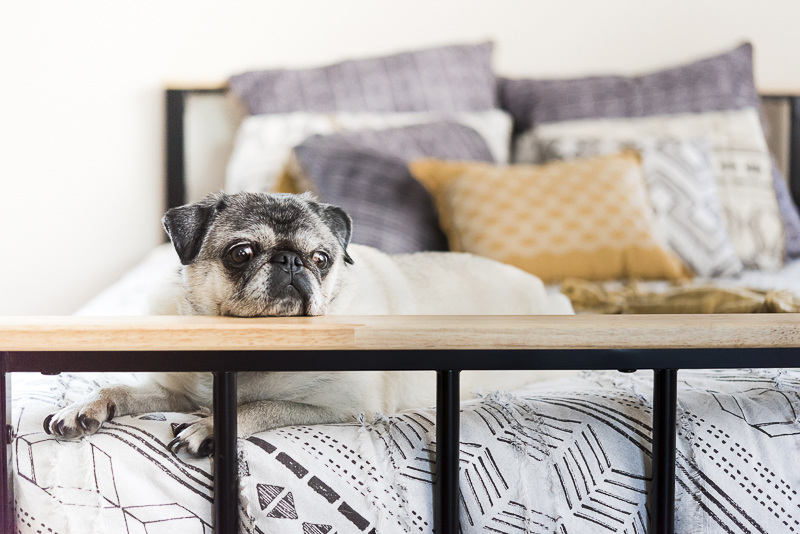 I distinctly remember after arriving, they opened the back hatch of their 4-door, and inside was a small little pug, sitting and staring at me from inside a crate. She was just quietly blinking her eyes at me. The elderly couple opened the half years, kissed her on the head, and placed her in my waiting arms. It was complete and utter love at first pug snuggle. She would visit briefly between her parties, work, and school schedule… for four years. Upon realizing the extent of neglect Tuesday was enduring, this kind couple went to their daughter’s apartment and removed Tuesday. They cared for Tuesday deeply and were sad to give her away, but they already had four dogs and also had custody of their young granddaughter. They knew they did not have the time to devote to Tuesday. I made a promise to them that day that I would always love her, provide for her in every way I could, and never lock her away in a crate. Six and a half years later I still keep in touch with them, and I think I’ve made good on that promise. 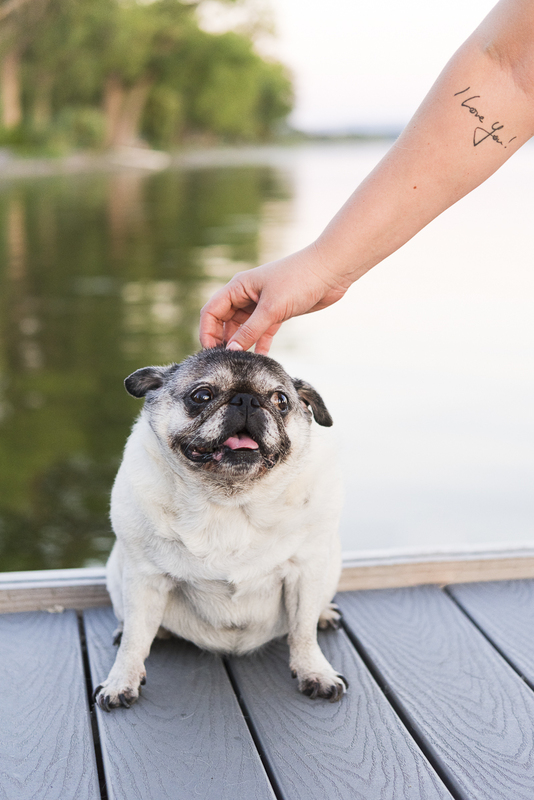 We take Tuesday on all our vacations which are more often than not, pug-related. She has been to Canada, New York City, Washington D.C., Chicago, Boston, and most recently, Philadelphia. 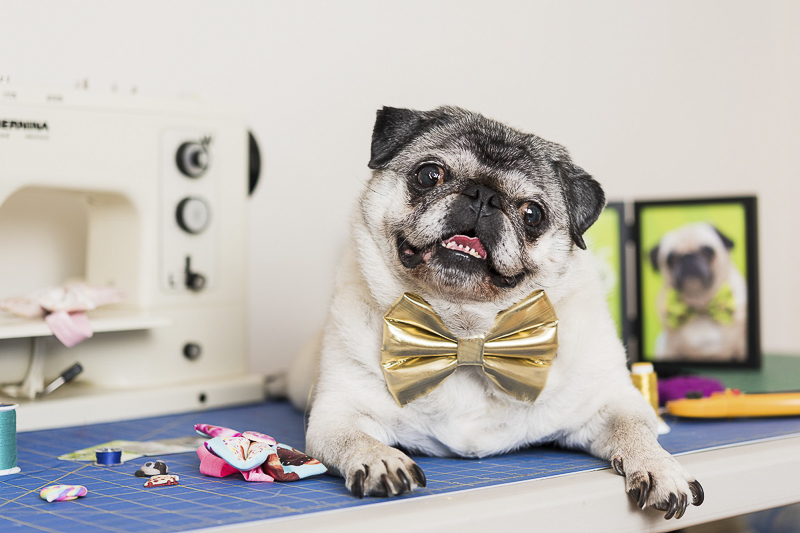 In addition to being an Instagram star, Tuesday has a line of bow ties: Tuesday’s Ties. I’m eyeing a buffalo plaid one for Theo. You can also see Tuesday’s Ties on Instagram. 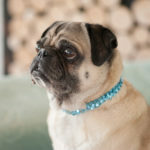 If you’re looking to adopt a pet, check out our list of Rescue Organizations or Petfinder.com. 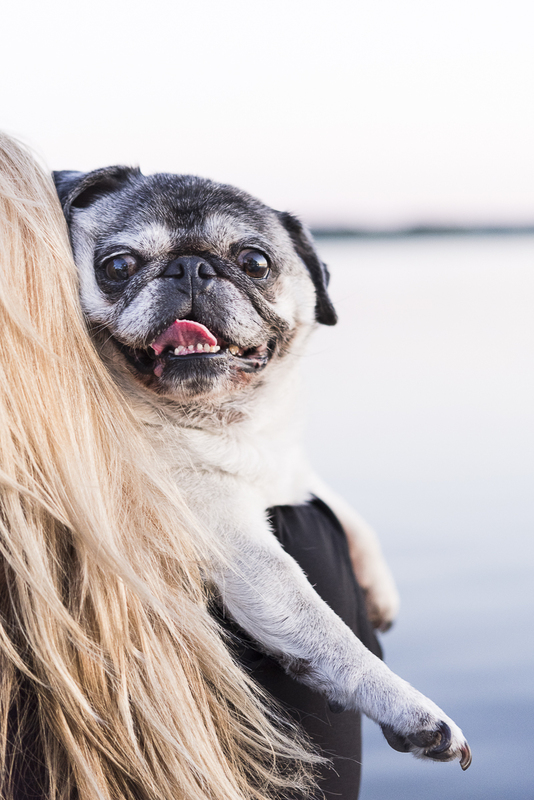 If you need to rehome a pet, please choose a no-kill rescue organization. Email rescue (@) dailydogtag(.com) to get your favorite rescue organization on our list. Follow Alice G Patterson on Instagram as well as her kitten, Little Highway Kitty. About Alice G Patterson Photography: Based in Syracuse, Alice is available for travel. 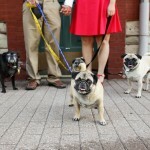 She specializes in dog portraits as well as photography for creative women entrepreneurs. This is such a sweet story and I do believe that the dogs choose us and not the other way around. Turns out we were given the ugliest husky from the pack who later on became the most beautiful one. These are the words of the owner of the parents of our husky that they gave us. She was ment for me but in the end both my husband and I knew that she had chosen my husband! They have a sixth sense about these sort of things. What a heartwarming article. I had forgotten details about Tuesday’s previous life before the adoption. Tuesday could not have found a better home or mom. OMG, I’m so jealous! I follow so many pug accounts and I would DIE if I ever got to meet any of them! I adore pugs with all my heart. Really hope I can have my own in the future! Alice was totally fangirling when she spotted Tuesday! 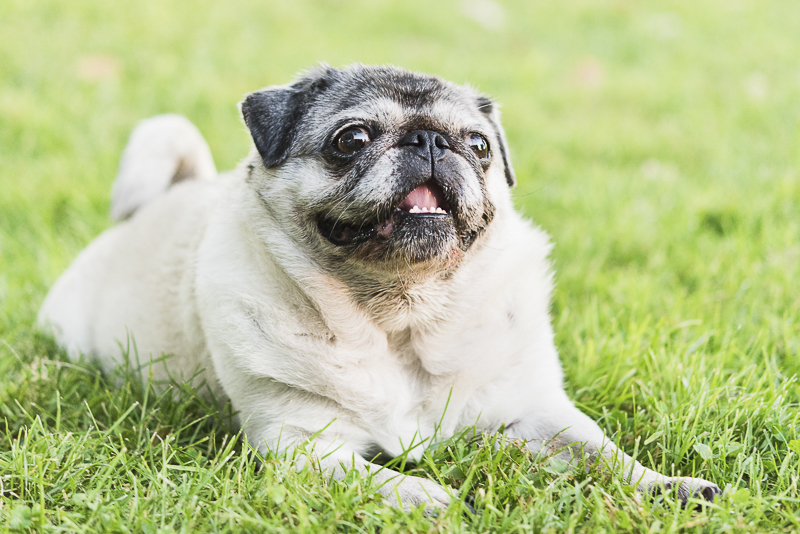 Pugs are so cute and have big personalities, but they are prone to some serious health issues. Pugs are my favorite! I think they have the sweetest little faces. These pictures are so adorable. Aww poor baby! So glad she is happy and cared for now. She is so cute! What a great story – to have such a great landing after dealing with neglect. Good on her grandparents for getting her placed in love. Wow! Tuesday has quite the backstory. I’m so glad that she was adopted and had a loving forever home to stay. 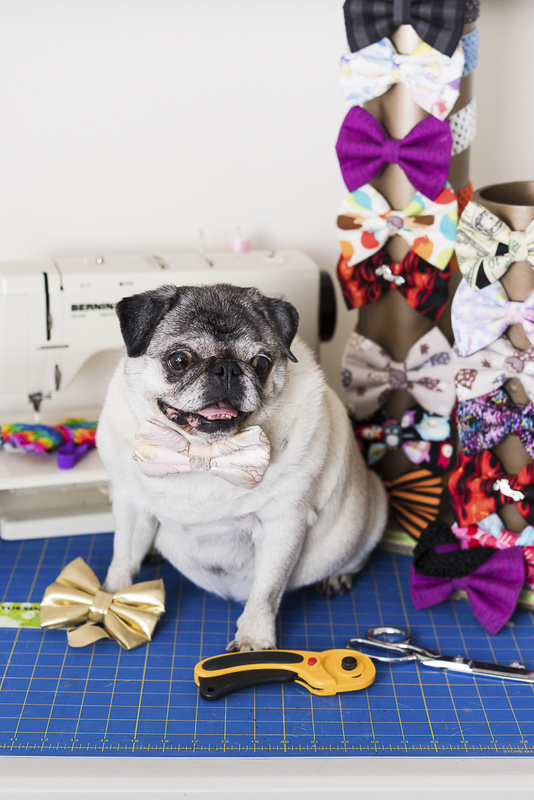 I’m impressed, her own line of bow ties too?! Lovely photo session. I absolutely love Tuesday too. 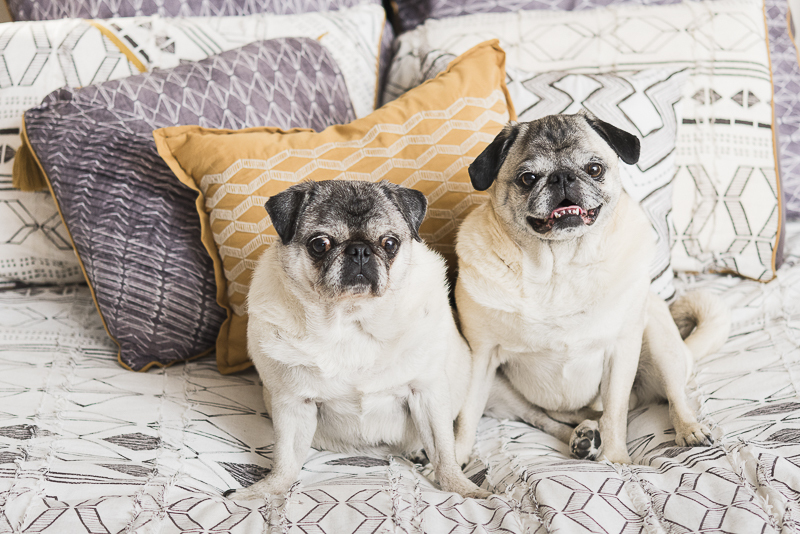 We are friends on PugChat. 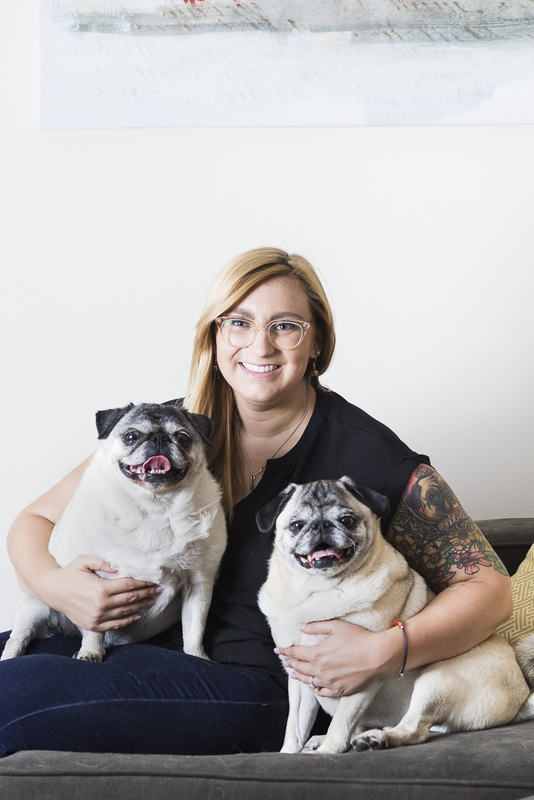 She came up to Toronto for Woofstock a few years ago and met my Kilo the Pug and Edie. She is absolutely the cutest and her Momager is super nice too. I forget you are so close in Syracuse- I drove through a few weeks ago. Next time I’ll have to say hi. This is such a warm story! I am such a big fan of dogs (and cats!) and I love coming here and seeing all your stories! 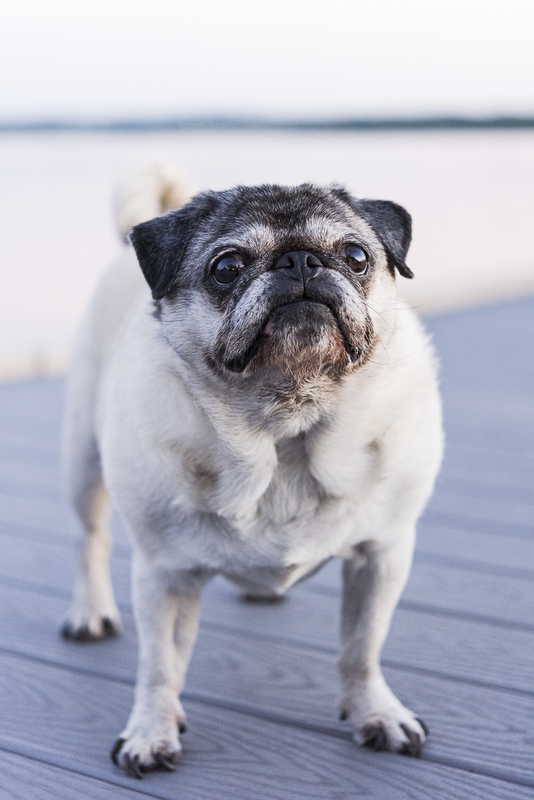 Don’t think I know anyone who owns a pug dog . 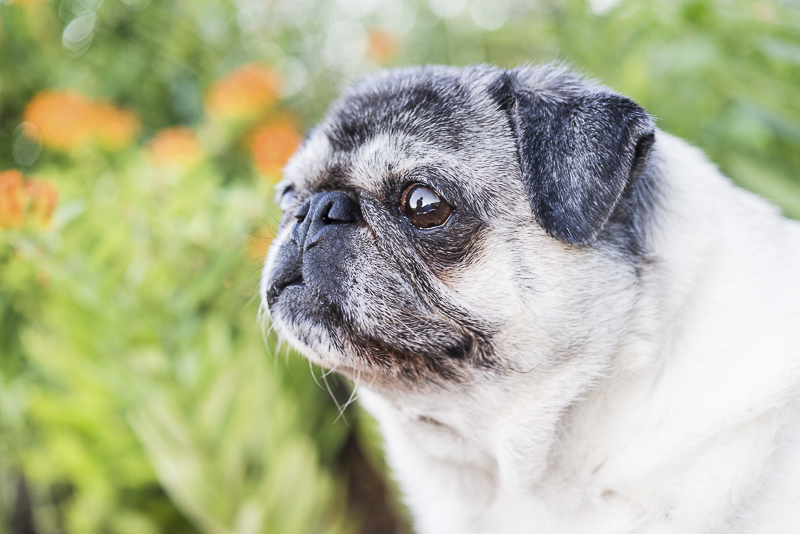 It is a cute breed and looks like it is very loved and cared for. 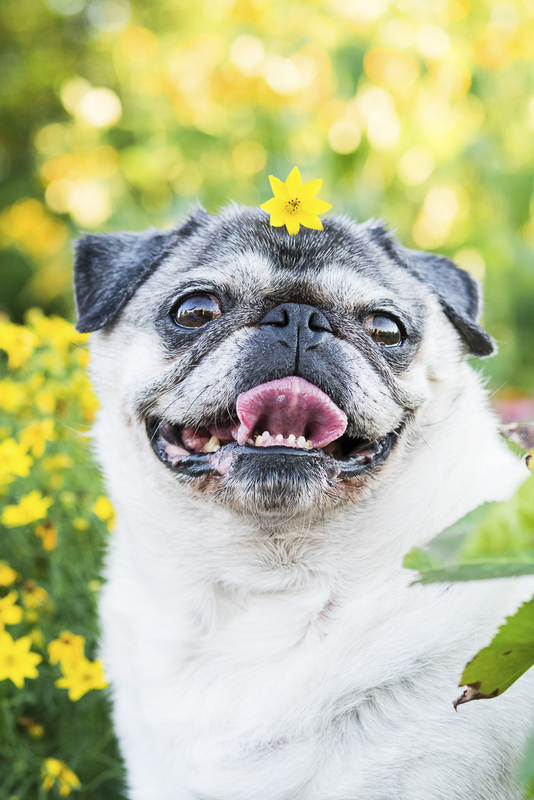 What cute photos of this pug! I need to do a family photo shoot with my golden retriever. Precious. I love when people rescue pets. We rescued our cats, and I wouldn’t have it any other way. My daughter would LOVE a pug. She’s always loved them. oh my gosh how adorable is this little one- such a great story too and thank you for sharing your sweet one with us. I want a pug SO bad. Our last dog was a rescue and he had A LOT of issues, so I am very leery about adopting next time to be honest. We’ll see when the time comes. 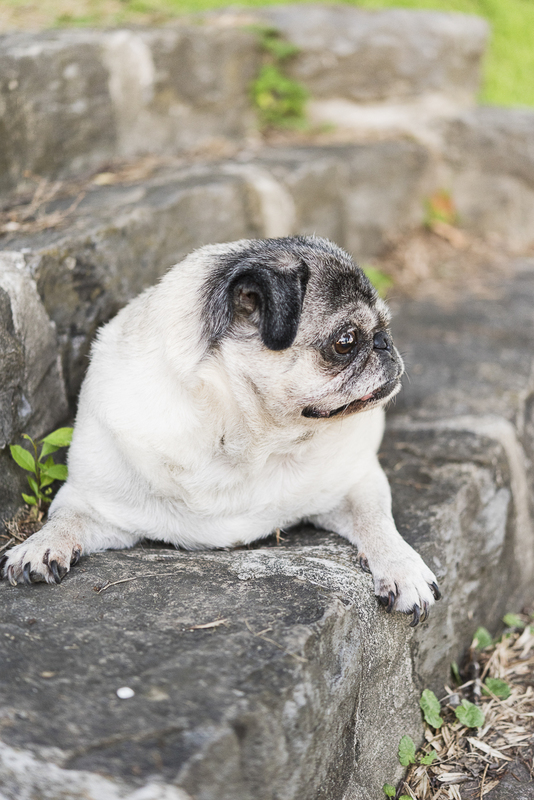 Pugs can have so many health issues. 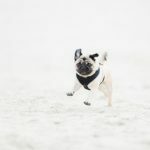 If you choose not to adopt, make sure you find a reputable breeder! Tuesday’s story just warms my heart! What a great couple and it’s so sweet that you have stayed in touch with them all this time. Tuesday is simply adorable! There is a special place in heaven for people that rescue animals. It is such a wonderful thing when people will take an animal that was neglected and just love on them so they know what love is. These are awesome pictures. After this cute little story I had to check out Tuesday’s Ties. Too cute. Our doggy would look pretty fly in a Tuesday tie. She is absolutely the cutest thing! I loved seeing all the pics of her. I also adore that you had the opportunity to help other pups who need it. What a wonderful story and how adorable is Tuesday! 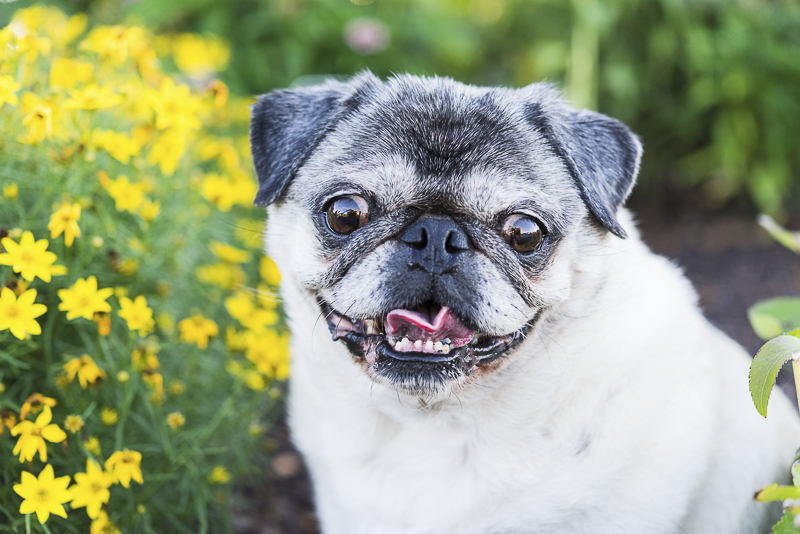 Definitely a pug I would love to hug! We have 3 dogs, one of who is a rescue. It’s so heartwarming to read about Tuesday! I love pugs. They are such cute dogs! When we went to the rescue, that was one of the breeds that my daughter really wanted to consider. 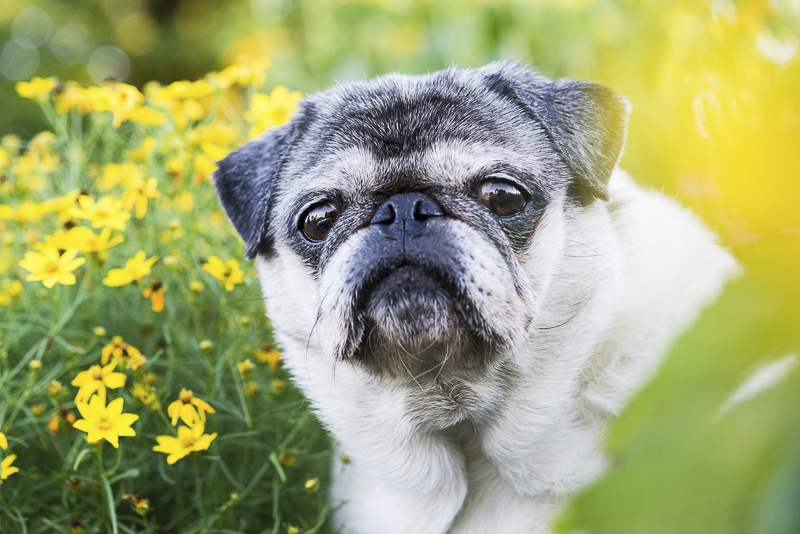 What a cute pug!! I love that you followed her on IG before realizing she lived close to you and you actually got to meet her!! How COOL is that?? What a heartwarming story, she’s so cute and looks so jolly, love you, furbaby. Oh my gosh, they are so adorbs! I love that they know how to smile for the camera, love all these pics. Love these photos! They are so cute! And them wearing those bow ties are just so adorable. I think my son would love a pug too. Those faces! OMG cuteness overload. Thank for sharing Tuesday and Kristen story. Tuesday is really cute. glad now she is having a happy home.